The Magic Mechanic advises you to begin shopping when your tires still have some tread left, typically 4/32" of tread depth—about the distance between George Washington's head on a quarter to the edge of the coin. 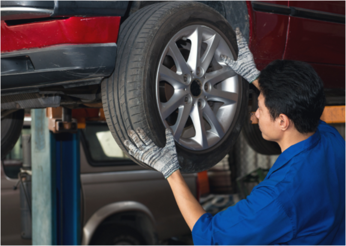 We have access to all the major brands and styles of tires. We can help you decide what tire could be right for you based on your driving style and whether you do a lot of highway driving or are a city driver. Tires naturally deteriorate over time, faster in hot climates. A tire's "birthday" is noted as a four-digit number following a letter sequence beginning with DOT, indicating the week and year it was manufactured — 5009, for instance, means the 50th week of 2009. Tires naturally deteriorate over time, faster in hot climates. A tire's "birthday" is noted as a four-digit number following a letter sequence beginning with DOT, indicating the week and year it was manufactured — 5009, for instance, means the 50th week of 2009.